Not a day goes by that I don’t think about breakfast; it’s pretty much my favorite meal of the day. (Okay, it is my favorite meal of the day) Sadly I don’t always have breakfast and if I do it’s usually something small. Call it the consequence of a busy schedule or perhaps that small bites of non-breakfast food in the morning does not a breakfast make! You see, when i think of breakfast, I think of grandiose monster plates teeming with lots of stuff and thangs. No I won’t just have Oatmeal – I want sides – and lots of them. Ooooh! Or a burrito packed to the brim with delicious layers of everything and more. I just like a lot of different tastes to choose from! What can I say – I love me some variety! 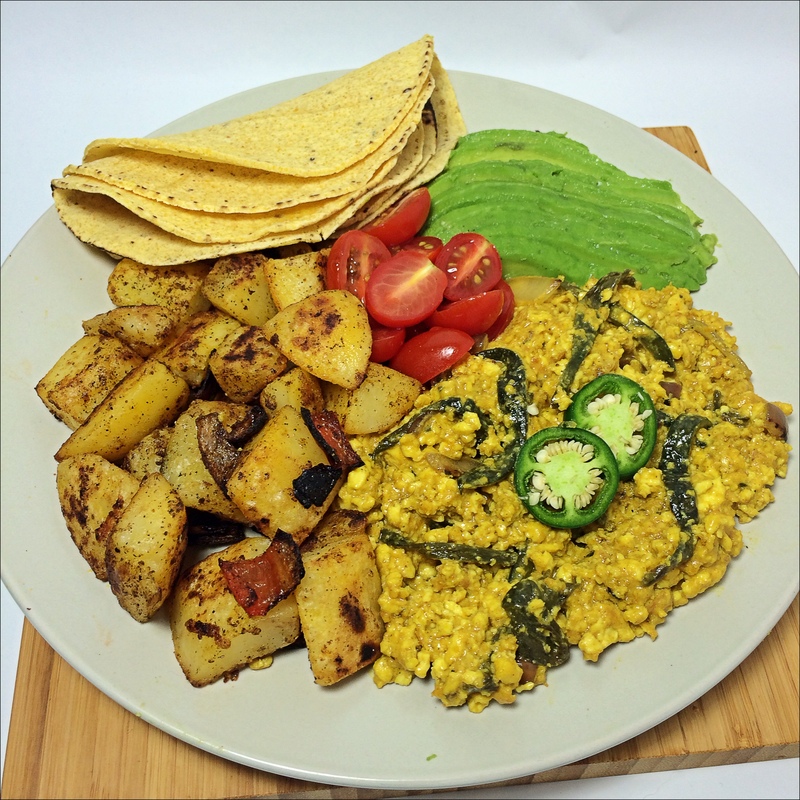 This is my (easy) recipe for Tofuevos con Rajas; essentially, tofu scramble with roasted poblano pepper strips, onions and (dairy-free, vegan) cheeze. If I’m not making a cheeze sauce myself, I usually reach for Daiya – In my opinion of what’s available – it’s the most pleasant tasting and it melts really well. In this recipe I use diced up bits of the Daiya ‘wedge’ but (obviously) feel free to substitute your favorite (melt-able) vegan cheeze here. 1. Roast your poblanos over direct heat using tongs or on a (dry) heavy bottom pan until completely blackened and charred. 1.5 – Basically, if it looks burnt you’re good to go! 2. Wrap roasted poblanos in a paper towel and place inside a plastic bag. Allow to steam / cool for about 10 minutes. 3. 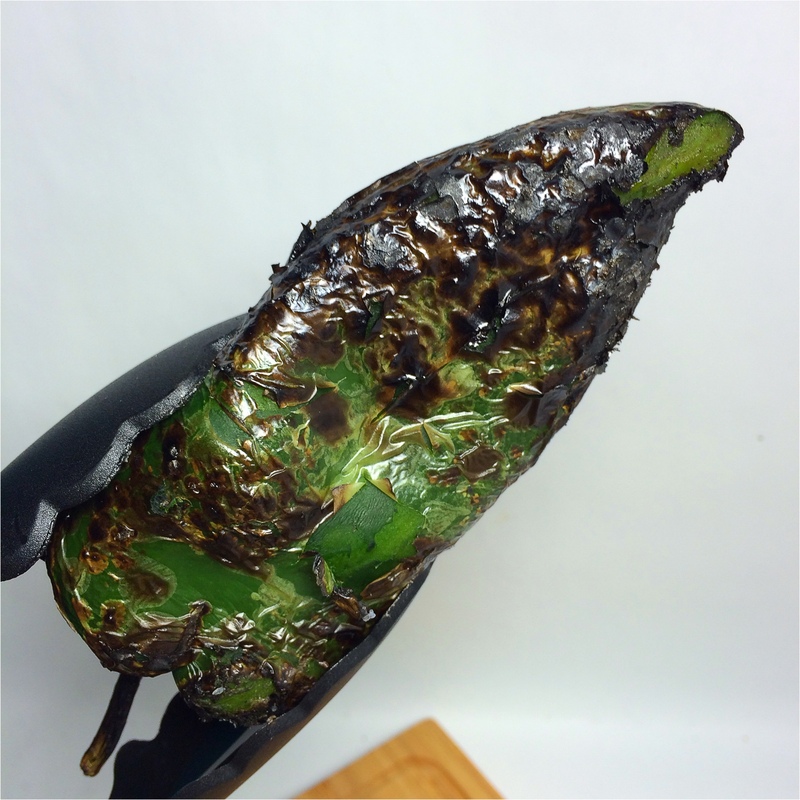 Pull poblanos from the plastic bag and rub off all of the charred bits with the paper towel. 3.5 – If you’re sensitive to chiles – use gloves or the bag to handle them. 1. Marinate your tofu as I do in this previous recipe. 2. Halve, cut the corners from and peel your onion. 3. Turning the onion sideways – cut thin strips (About 1/4 inch wide). 4. Heat 1 tsp oil in a large sautee pan. 5. Cook your onions over medium heat until tender (about 5 minutes) stirring intermittently. 6. Add your Poblano Strips (Rajas) and mix together with cooked onions. 7. Remove from pan; set aside. 8. Add remaining oil in your pan (over medium heat) add your tofuevos. 9. Cook for 4 minutes stirring intermittently. 11. 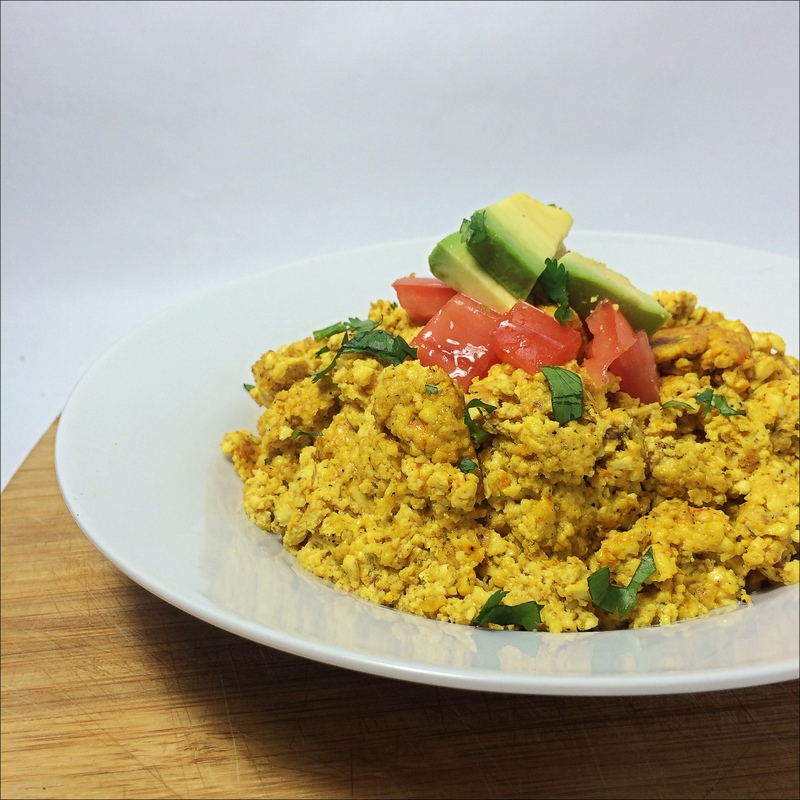 Sprinkle your vegan cheese of choice and stir to incorporate. 12. Lower heat to low, cover and allow cheeze to melt. Serve your dish up with tortillas – store bought or fresh (my recipe here). Sliced avocado, hot sauce and perhaps a nice salsa fresca (my recipe here).